Of all the hundreds of moons in the solar system, none are weirder than Saturn's satellite Iapetus. We've already talked about its walnut-shaped ridge, but that's nothing compared to the weird optical illusion that lets it disappear from our telescopes. Astronomer Gian Domenico Cassini first sighted Iapetus in 1671. The problem was that he could only see it half the time. When it was west of Saturn, it was quite bright and easily observed but it completely vanished whenever it was supposed to be on the eastern side of the planet. It took Cassini until 1705 to finally come up with an answer: Iapetus must somehow be extremely bright on one hemisphere and extremely dark on the other. But it wouldn't be for another 300 years until we actually figured out why Iapetus would have such unusual characteristics. Astronomers had long theorized an internal eruption or a giant impact - like the one that created its distinctive ridge - had created this planetary darkness. New photos have now revealed the real reason: the thick top layer of ice has been completely vaporized on one of the moon's hemispheres, leaving behind a new layer of thick black carbon. It's a simple enough explanation, and it seems a shame that something so mundane should baffle Cassini for over thirty-four years. Still, there's at least one small consolation for him...after all, the crucial photos were taken by NASA's Cassini orbiter. I'm giving him partial credit for solving the mystery after all. 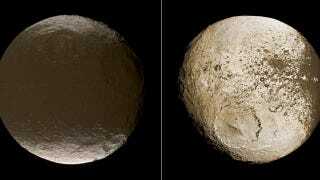 For more on Iapetus's weirdness, check out Sky and Telescope.